First Line: She knelt on the window-sill, looking out over the sea. Lanzarote, the strangest and wildest of the Canary Islands. In 1879, a wealthy young woman eloped with a poor fisherman from this windswept volcanic island. In 1968, Perdita West, personal assistant to famous author Cora Gresham, arrives there with her employer on an extended research trip. Both women fall under the island's spell, and Perdita is quite impressed when meeting Cora's son, Mike. When Cora goes off to do research, Perdita takes the opportunity to go snorkling, but a landslide traps her in an underwater cave. No one knows where she is, so she has to rely upon herself for rescue. Her efforts to escape will solve a century-old mystery. So much goodness in so few pages. No wonder Mary Stewart was a bestselling author back in the day. Other than the lack of today's electronic accoutrements, The Wind Off the Small Isles holds up every bit as well as it did when first published. 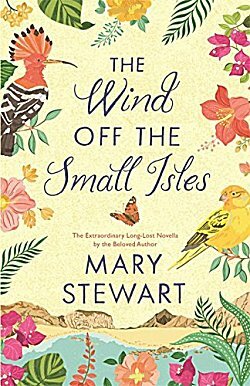 Oh, my, I've not thought of Mary Stewart in so long, Cathy! But she could tell a great story. Thanks for the reminder, and I"m glad you enjoyed this. Reading this reminded me of how much I enjoyed some of her other books. Sounds very good. I've not read this author. She was very popular in the 1960s and 1970s, Mystica. She's one of the best romantic suspense writers ever.